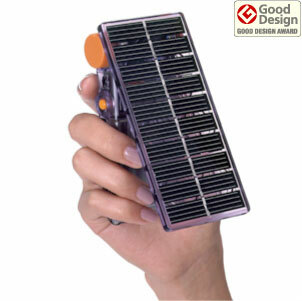 A pocket sized solar power station designed for charging AA/AAA batteries, and the batteries of small mobile applications, such as cellular phones, PDAs, digital cameras, portable audio/visual devices, and portable games. A long life and evergreen product awarded GOOD DESIGN AWARD 2001-2002, Small and Medium Enterprises Prize. A global, economical and environmentally friendly power source for anyone on the planet. An ideal companion to mobile appliances with its size, weight, compatibility, expandability and charging whilst carrying design. A reliable and durable outdoor tool with its simple and robust structure. Designed for charging 2 pieces of AA or AAA (sold separately) Violetta Ni-MH rechargeable batteries at the same time by sunlight. The batteries can be charged in shorter time by interconnecting 2 or more units with DC Power Cables (sold separately). Designed for charging the batteries of DC4V-6V appliances, such as cellular phones, PDAs, and audio/visual devices with USB Power Adaptors(sold separately) and with widely available USB charger cables. Designed for powering DC3V appliances, such as audio/visual devices with DC Power Cables. Equipped with the most efficient single crystalline silicon solar cells for the maximum power generation for its size. Made of UV resistant polycarbonate and special polymer materials withstanding the maximum abuse under the sun. Equipped with a reverse current prevention circuit, a solar power indicator and a battery status indicator for carefree operations, and 2 DC in/out jacks for the maximum expandability. Packed with an AAA battery holder. It is not necessary to wait until the batteries are fully charged before use. You can keep the batteries always charged when not in use by leaving them in the charger and facing it to the sunlight regularly. Violetta Ni-MH rechargeable batteries are designed to stand high temperature and overcharging under sunlight, and Violetta Solargear is equipped with the reverse current prevention circuit to protect the batteries from discharging at nighttime without sunlight.